Newt Gingrich, the Republican presidential hopeful, wants you to know that as commander in chief he is ready to confront one of the most nightmarish of doomsday scenarios: a nuclear blast high above the United States that would instantly throw the nation into a dark age. In debates and speeches, interviews and a popular book, he is ringing alarm bells over what experts call the electromagnetic pulse, or EMP - a poorly understood phenomenon of the nuclear age. 'Millions would die in the first week alone,' he wrote in the foreword to a science-fiction thriller published in 2009 that describes an imaginary EMP attack on the United States. 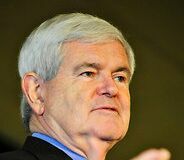 A number of scientists say they consider Mr. Gingrich's alarms far-fetched. Broad had his skeptic's hat on. To even begin to attempt to do what Mr. Gingrich fears, these rogue states would have to perfect big rockets, powerful bombs and surreptitious ways to loft them high above America, military experts say. And if they did - and there are much easier ways to deliver a nuclear bomb than by missile, these experts argue - United States defenses would spring into action.